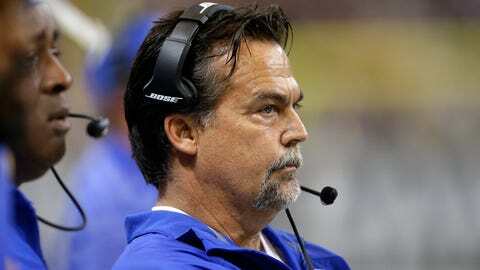 Coach Jeff Fisher and the Rams face only one team with a winning record in the next five weeks. The St. Louis Rams came out of their bye week in pretty good shape in the NFC West standings. With the front-running Arizona Cardinals and Seattle Seahawks each losing, the Rams (2-3) moved into second place in the division heading into a Week 7 matchup against the visiting Cleveland Browns on Sunday. That kicks off what appears to be a favorable portion of the schedule for St. Louis, which plays three of its next four games at home and will face only one opponent with a winning record – Minnesota (3-2) – over the next five weeks. As pointed out by Bernie Miklasz on 101sports.com, the Rams have a chance to make a move in the standings with eight of their final 11 games coming against foes currently below .500. If St. Louis is able to navigate through the next five games and stay within striking distance of first place in the division, two big tests loom in back-to-back matchups at current unbeaten Cincinnati (Nov. 29) followed by a home matchup versus the Cardinals the following week.